Free shipping on your holiday orders ends today! Happy Cyber Monday! Ending today at 11:59 p.m. Eastern time, Drum Corps International is offering you FREE SHIPPING on all orders placed at the official DCI online store. Be one-day-and-done with your holiday shopping for the special drum corps fans in your lives by shopping today! 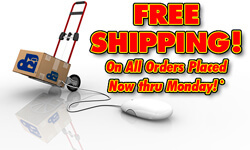 *Free shipping is limited to standard delivery within the Continental U.S. excluding APO/FPO addresses. Entire order must ship to a single address. Does not apply to prior purchases or open orders and cannot be combined with any other offers. Customer is responsible for shipping costs on returned merchandise. Promotion may be modified or terminated at any time. Certain restrictions may apply. Promotion ends on Monday, Dec. 1 at 11:59 p.m. ET.